Next week I will be in Orange Beach, Alabama, for The World Food Championships. I am honored and excited to once again be representing Louisiana. The World Food Championships is the world’s largest food competition. There are 10 categories and 40 teams within each category. In order to compete in the competition, one must first win a qualifying event. This year I won my spot in burger with the Taste of America challenge. To meet the challenge requirements certain foods and spices had to be infused into the final dish. Two of the items were chicken and spicy ground sausage. Give a Louisiana girl chicken and sausage and immediately jambalaya comes to mind. But then I realized I had leftover dirty rice. So I thought, why not–leftovers for the win! I named my chicken and pork dirty rice burger, Cajun Dirty Bird. There are a few components to the Cajun Dirty Bird, but all relatively easy to put together. Put red onions and Cole slaw mix into a glass bowl. Pour 3 cups boiling water over mixture. Cover bowl and let stand for 5 minutes. Drain. In a small bowl, add hot sauce and Spice Blend and whisk in olive oil and red wine vinegar. Pour over Cole slaw and onions. Toss well to coat. Cover and chill in refrigerator for at least 2 hours. Add 1 tsp olive oil to skillet over medium heat, saute onion, pepper, celery, and garlic until wilted, about 5 minutes. In food processor, grind chicken, sausage, and rice together. Remove to bowl. Using hands, lightly blend in onion, pepper, celery, garlic, and seasoning into meat mixture. Form into patties. Place in refrigerator for 30 minutes. Heat cast iron skillet with remaining olive oil over medium high heat until shiny. Add burgers, Cook 4 minutes. Flip. Cook 4 additional minutes. Mix together flour, cornmeal, and Cajun seasoning. Toss okra. Fry until crispy, about 1 minute. 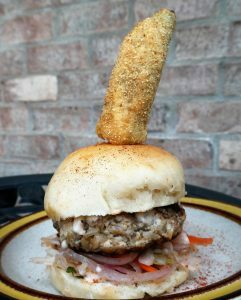 To Assemble: Spread top bun with remoulade sauce, mound slaw on bottom, top with burger, garnish with pickled fried okra, if desired. 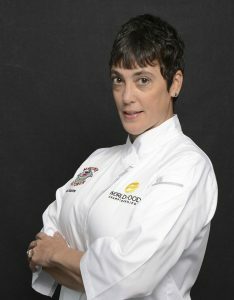 FOOD FUN: Competing at the World Food Championships is the ultimate thrill for me. Want to get into the action? Head to the Wharf at Orange Beach, Alabama November 7-11, 2018 or follow all the excitement at The World Food Championships website or stay tuned to my Facebook page.